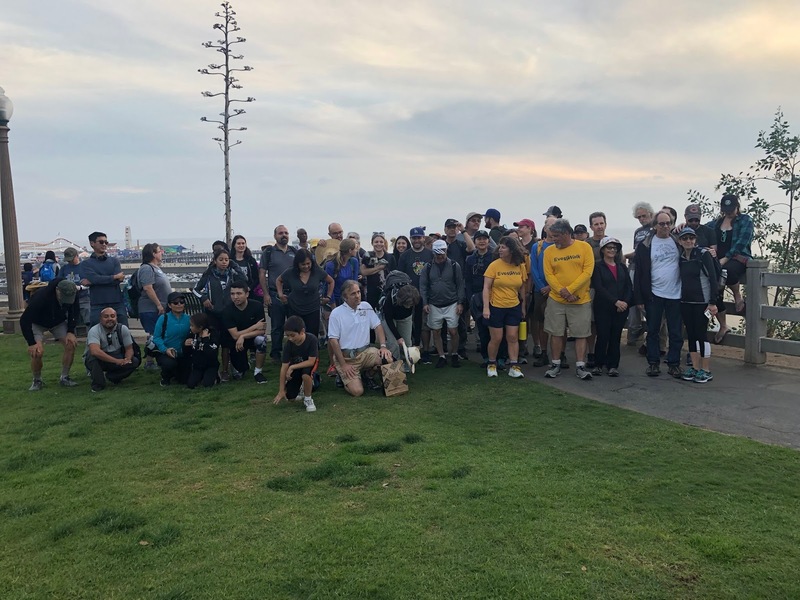 Another year, another successful walk from downtown Los Angeles to the ocean! The Great Los Angeles Walk hiked down 6th Street for its 13th edition, and hundreds of passionate Angelenos -- fueled by love of city and community and eager to walk across the city -- hiked from Pershing Square to the ocean on Saturday, Nov. 17. This year's Walk was also meant to be a tribute to Jonathan Gold, the late Pulitzer Prize-winning L.A. Times food critic who celebrated our city's vibrant neighborhoods, multicultural population and, of course, its food. 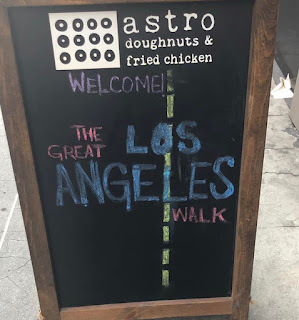 Astro Doughnuts & Fried Chicken served up special goodies for Walkers before the morning, and as the crowd grew in Pershing Square, it looked to be one of our biggest turnouts yet. 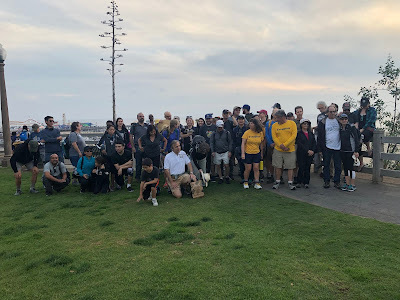 Plenty of returnees, and a lot of newbies, were on hand to once again celebrate community and explore their city on foot. Of course, it wasn't even Angelenos. 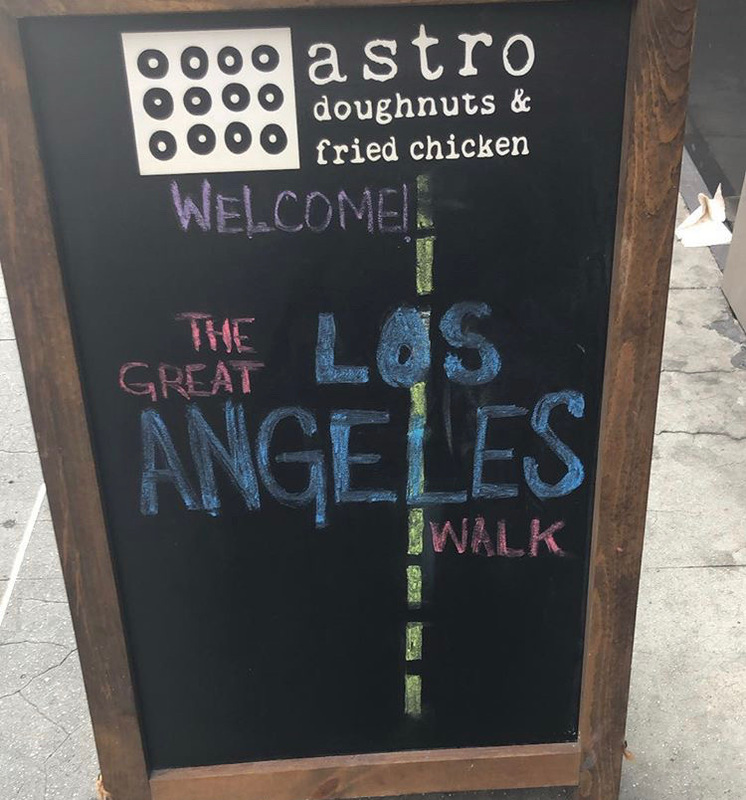 We're starting to get people from all over the country — and even the globe — to plan their Los Angeles trips around the Great LA Walk. On Saturday, I met a couple who flew all the way from Singapore to take part! Wow! 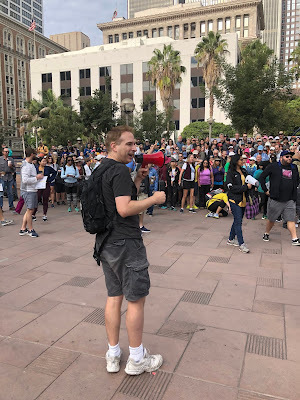 With the crowd eager to make it to the coast by sunset, I kept this year's opening short and sweet — once again giving a brief history of the walk, and a few pointers. 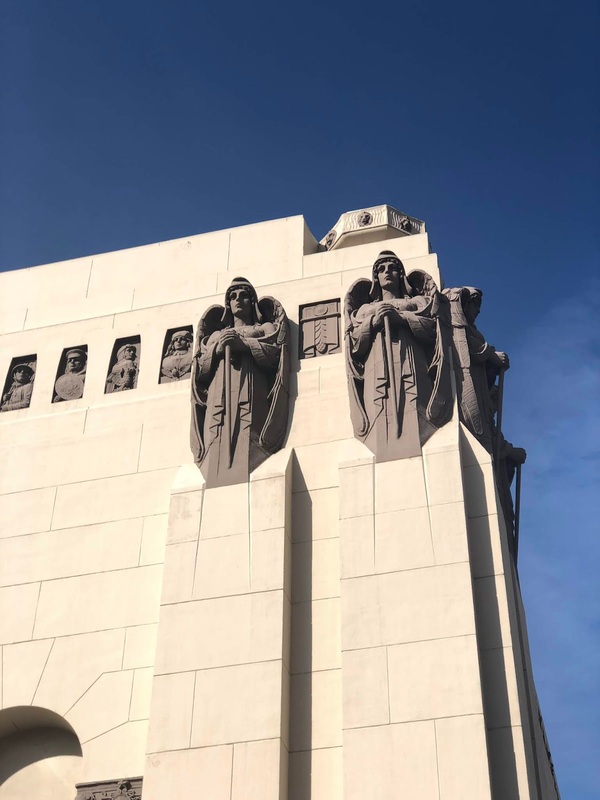 From there, we hopped on to 6th Street, and walked past the Los Angeles Central Library, the Standard Hotel, the Jonathan Club, a film shoot (it's downtown, natch! ), and on to the median that would take us over the 110 freeway. On the other side of the 110 it was Westlake, where we passed by the Pacific Dining Car, some unusual murals, MacArthur Park (with officers on horses! ), a Hungarian memorial, Lafayette Park, the First Congregational Church, and then the start of Koreatown. Several of us went inside and explored the Chapman Market; we then listened to Cassell's Hamburgers ordering us to "Eat Pie," and we made our way through the amazing homes of Hancock Park — including Getty House, the official L.A. mayor's residence. At the La Brea Tar Pits, some of us marched through the grounds -- taking a big whiff of tar -- before walking behind LACMA and under "Levitated Mass," the massive rock propped up by pretty strong beams. 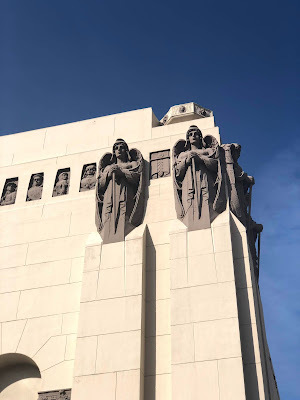 We saw the back of the future site of the Motion Picture Academy museum, and then as 6th Street ended, walked up San Vicente to Burton Way and Beverly Hills. We walked by the Four Seasons, the Beverly Hills Courthouse, Civic Center, and Library. We saw he Union 76 gas station designed by Gin Wong of Pereira and Associates, and a tribute to 9/11 and the World Trade Center towers. We passed by the Wallis Annenberg Center for the Performing Arts, and then had lunch in Beverly Hills. Then it was on to Century City and Santa Monica Blvd., which we walked the remainder of the way to the ocean. As we marched toward Santa Monica, we felt the cool ocean breeze, and then celebrated at the Ye Olde King's Head in Santa Monica. The crowd gathers before the walk. Thanks to Astro Doughnuts & Fried Chicken for fueling our Walkers before the big day began! More of the crowd gathering. Oh hi, there's me, kicking off this year's Walk with info and more. Working our way West on 6th. The crowd passes the Standard Hotel — once the Superior Oil building, erected in 1955. On to the median and passing over the 110. Happy birthday Great Los Angeles Walk — you're a teenager! The twins of the Pacific Dining Car. Welcome to the Hotel California...n.
MacArthur Park is not melting in the dark. LAPD horse... and his officer. The MacArthur... formerly known as the Park Plaza Hotel. One of several kitchen appliances we encountered on the Walk. We could populate a house with all the items we found! First Congregational Church — site of countless film and TV shoots. Quite a few dog photos also lining 6th and the rest of the walk. I truly don't know what's going on here. Squirrel crossing at a Hancock Park home. Steps to the top of the La Brea Tar pits museum. USC dog was sad this Saturday. Kevin & Bean, still on KROQ! #Gratitude for everyone who joined this year's Walk! And at the end... too cloudy to really see the sunset. But happy to see so many at the end! Walt's hat includes many of the Great Los Angeles Walks he's joined over the years. And that's a wrap for 2018! Send us links to your photos! And we'll add some roundups below. Meanwhile, remember that the Great Los Angeles Walk takes place every year on the Saturday before Thanksgiving. We'll see you on Saturday, November 23, for the 14th annual!